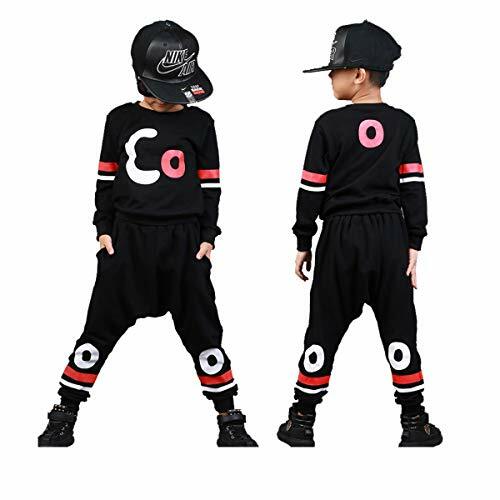 2.Special design, make your kids fashionable and stylish.We have spent countless hours improving both the design and quality of this clothing set. 3.OUR GUARANTEE - You'll Totally Love It, or Get All Your Money Back - We offers a 100% satisfaction guarantee, if you are not satisfied with our product or service for any reason, please feel free to contact us. We will either refund your money or redeliver a new product. The choice is yours! We promise! 3-4 Years/Tag 110----Top Length 43cm(16.9")--Bust 68cm(26.7")--Sleeve Length 39cm(15.3")--Pant Length 63cm(24.8")--Waist 44cm(17.3")--Height 38-42"
4-5 Years/Tag 120----Top Length 46cm(18.1")--Bust 72cm(28.3")--Sleeve Length 42cm(16.5")--Pant Length 68cm(26.7")--Waist 46cm(18.1")--Height 42-45"
6-7 Years/Tag 130----Top Length 49cm(19.3")--Bust 76cm(29.9")--Sleeve Length 45cm(17.7")--Pant Length 73cm(28.7")--Waist 48cm(18.9")--Height 45-49"
8-9 Years/Tag 140----Top Length 52cm(20.4")--Bust 80cm(31.4")--Sleeve Length 48cm(18.9")--Pant Length 78cm(30.7")--Waist 50cm(19.7")--Height 49-53"
10-11 Years/Tag 150--Top Length 55cm(21.6")--Bust 84cm(33.1")--Sleeve Length 51cm(20.1")--Pant Length 83cm(32.6")--Waist 52cm(20.4")--Height 53-57"
12-13 Years/Tag 160--Top Length 58cm(22.8")--Bust 88cm(34.6")--Sleeve Length 54cm(21.2")--Pant Length 88cm(34.6")--Waist 54cm(21.2")--Height 57-61"
Material: cotton blend. it is warm,soft and not irritative kid's skin. Fashion design,high quality,best gift for your kids. Season: Winter / Fall / Spring.Occasion: casual, daily, sleep wear, play wear,baby home coming,baby shower gift, or photograph etc.